OffMeshLink component allows you to incorporate navigation shortcuts which cannot be represented using a walkable surface. For example, jumping over a ditch or a fence, or opening a door before walking through it, can all be described as Off-mesh links. Start Object describing the start location of the Off-Mesh Link. End Object describing the start location of the Off-Mesh Link. See in Glossary area. The cost override becomes useful when you want to make the agents generally favor walking, but use the off-mesh link when the walk distance is clearly longer. Bi-Directional If enabled, the link can be traversed in either direction. Otherwise, it can only be traversed from Start to End. Activated Specifies if this link will used by the pathfinder (it will just be ignored if this is set to false). 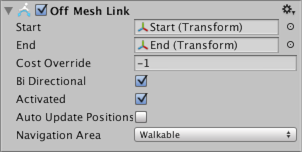 Auto Update Positions When enabled, the Off-Mesh link will be reconnected to the NavMesh when the end points move. If disabled the link will stay at its start location even if the end points are moved. Navigation Area Describes the navigation area type of the link. The area type allows you to apply a common traversal cost to similar area types and prevent certain characters from accessing the Off-Mesh Link based on the agent’s Area Mask. If the agent does not traverse an Off-Mesh link make sure that both end points are connected correctly. A properly connected end point should show a circle around the access point. Another common cause is that the Navmesh Agent’s Area Mask does not have the Off-Mesh Link’s area included. Creating an Off-Mesh Link – workflow for setting up and off-mesh link. Building Off-Mesh Links Automatically - how to automatically create. Off-Mesh Link scripting reference - full description of the Off-Mesh Link scripting API.